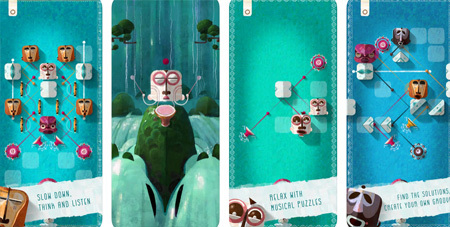 ELOH is a chilled out puzzle game from Broken Rules, to help you relax and find your groove. From the creators of the Apple Design Award winning Old Man’s Journey, ELOH is a new musical puzzle game about feeling the rhythm to find the solution. Slow down, start listening and let the groove guide you through 85 levels. Just satisfying gesture controls designed for touch, with a smooth learning-curve and pressure-free attitude. Experiment with the positions of good spirits to solve the levels. Each spirit comes with its individual jam and lets you build your personal groove. Enjoy beautiful hand painted visuals and joyful animations, original and catchy soundtrack. If you get stuck in the game, check out the video walkthrough and gameplay for the game. This entry was posted in Android Games, iOS Games, Mobile Games, Walkthrough and tagged ELOH Cheats, ELOH Game, ELOH Gameplay, ELOH Guide, ELOH Hints, ELOH Review, ELOH Solutions, ELOH Strategy, ELOH Tips, ELOH Walkthrough by Marvin. Bookmark the permalink.